Sosua Ocean Village is a great place to vacation with your family, located right on the ocean the community has many amenities like pools, water slides, spa, gym, tennis, and basketball courts. There is a beautiful ocean front restaurant serving excellent food. This 1,900 sq. 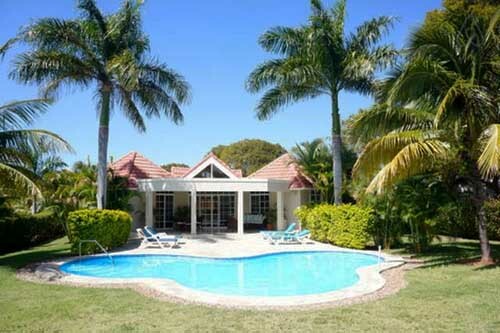 ft. Villa is a short 15 minute drive from the Puerto Plata Airport. With marble tile throughout the villa, it has a fully-equipped kitchen with granite counter tops, and stainless steel appliances. There is also a rooftop patio with a lounge seating area that features an additional outdoor shower ideal when your sunbathing on the rooftop and need to cool down. The kitchen is furnished with stainless steel appliances and a variety of small appliances for all your cooking needs microwave, toaster, coffee maker, blender as well as a variety of pots, pans and dishware. Guest bedroom 3 features two Queen beds, AC and is perfect for families with children the bedroom also includes a large closet and a private bathroom with separate shower. Luxury 3 bedroom and 3 bathroom Apartment in the center of Cabarete with 2,350 sq ft, right on Cabarete Bay and convenient for all the water sports, restaurants and soaking up the sun. A large living room with an American kitchen separates the master bedroom from the two other bedrooms. The spacious terrace is reachable both from the master bedroom and from the living room. Decorated in a unique way using the highest quality materials and provides exceptional living conditions. Very intimate arrangement of condos with pool just for this small grouping. 24 hour security, utility management for 24 hour electricity with backup generator, water, garbage collection, and common area lighting throughout the grounds, plus of course all accounting. This modern 3 bedroom ocean front condo for sale in Sosua is a superb example of a luxury Caribbean beach front property. Offering over 3,200 sq ft of modern contemporary living space, the Sosua property is truly exceptional with a sleek, luxurious ambiance highlighted by quality Italian fixtures and fittings and gorgeous white tiles. These exclusive ocean front condo are situated just a few minutes walk to the nice and cozy Sosua center with all the bars, restaurants and little shops. The complex is on a white sandy beach with Private Beach Club and tropical gardens. The views of the sea and the surrounding areas are absolutely stunning and sliding glass doors opening out to the terrace and the pool allow for the seamless integration of the indoor and outdoor living areas. Enjoy impeccable service matched with mouthwatering dishes authentic to the island and Italy’s traditional cuisine. Baia Lounge & Restaurant is just a short stroll away from your room. Feel the sweet ocean breeze, while indulging on savory culinary creations or find comfort in the warmth of Baia’s indoor dining. Its bi-level interior invites two worlds of to come together as one with our Asian-fusion restaurant nestled on the upper level. Beautiful new modern villa in beach side project. This 3-bedroom, 175 square meter stand alone villa has its own private swimming pool and lush tropical gardens. An exterior stairway provides access to a roof-top terrace that has fantastic ocean views. Community amenities include the Sosua Ocean Villa Beach Club which has a world class spa, gymnasium, beach-front restaurant, multiple swimming pools, numerous play areas for children, and various social areas that can be used for small intimate gatherings or large convention-type meetings and social events. This single storey villa provides a light and airy open plan living and dining area with kitchen separated by breakfast bar. In addition, there is a family room area, covered terrace and roof terrace with pergola and ocean view, all great for outdoor living. A half bathroom and laundry room are provided for convenience. Three bedrooms, master with en suite bathroom and walk-in closet, and two further bedrooms with shared bathroom. The private, enclosed yard boasts a pool, half bathroom, portable barbeque’s and pergola covered parking for two vehicles. 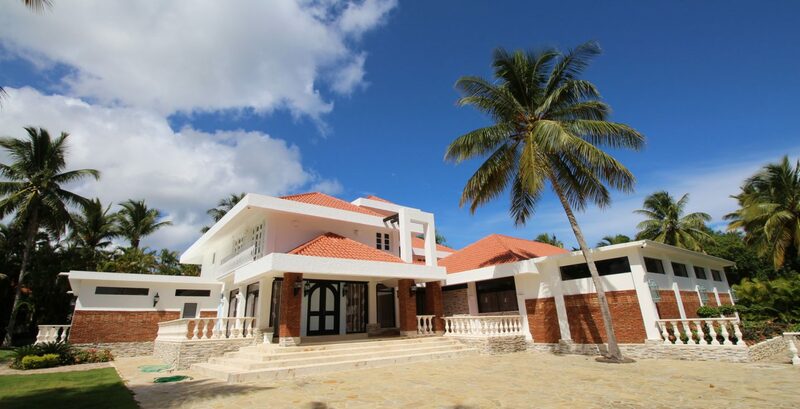 The luxurious 5 bedroom villa is on 2 floors, with an additional 2 bedroom guest house. On the first floor of the villa is a spacious living room and a high-quality mahogany kitchen. 3 bedrooms with bathroom, laundry room and a covered terrace with views of the pool with a pool bar and garden with guest house. On the second level it has 2 bedrooms with bathroom, each room with private terrace and fantastic ocean view, besides a small living room with bar and view to the lower living room. 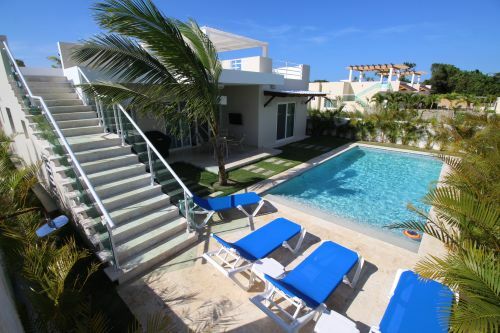 This villa + guesthouse in the Dominican Republic for example can sleep 10 people for only $499 per night. Not only is that an insane deal, but the house is gorgeous and comes with a private pool and private beach entrance, a patio overlooking the ocean, and two bars — one of which is in the pool. The five-bedroom, five-bathroom house has plenty of space to throw a party for a large group, and comes equipped with a full kitchen, a housekeeper, and a security guard. If you’re lucky, the housekeeper will make you an incredible piña colada with local ingredients. For an additional fee, a private chef will cook a five-course meal, and drivers will take you to the island’s best restaurants. It is the perfect location for visitors that value their privacy and enjoy waking up to birds singing and waves crashing on the beach. Important – $499 up to 10 people and $50 extra/person/day up to 16 people max. This stunning beach front apartment with 3 bedrooms has breath-taking ocean views and is just steps from the beautiful white sandy beach and Turquoise Ocean beyond. This luxury condo is situated on the 2nd floor offering guests spectacular panoramic views overlooking the pool and Azur Sea. Ocean One is located in a small beach village of Cabarete only 20 minutes away from Puerto Plata International Airport on the northern shore of the Dominican Republic. 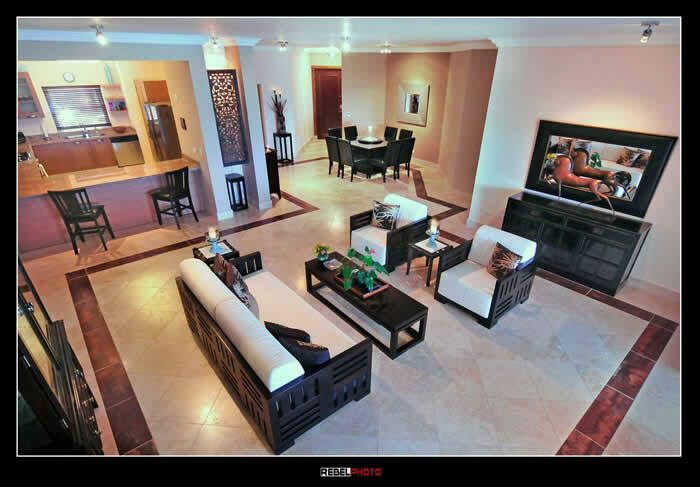 The apartment is within walking distance to all the amenities Cabarete has to offer. It is a perfect tropical vacation spot with its charming, hip ambience and a combination of relaxed and adventurous lifestyles. Visitors can enjoy its wonderful beach, the charming local shops, the great bars and the relaxed beach side restaurant. 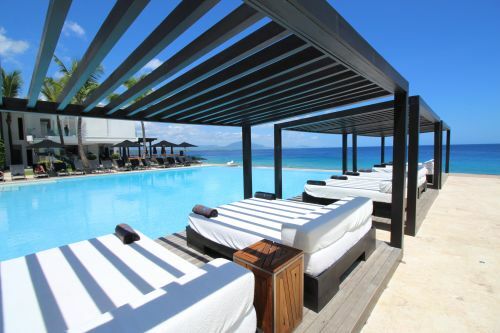 The location of Ocean one makes it the ideal place for a family vacation to Dominican Republic. Cabarete is the ideal place for kite surfing and windsurfing and is considered one of the best places to practice these sports in the Caribbean. Kite Beach is the best area for kite surfing with flatter inside water and waves, too. For the less adventurous one can stand up paddle board the lagoon or at Bozo beach. 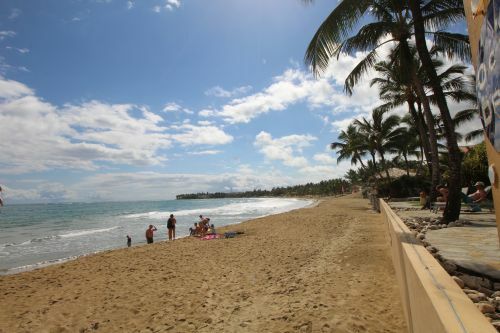 Cabarete also has a great beach and this has a lot of great bars and restaurants. 3 large bedrooms (sleeping 6) and also has an Independent Studio (sleeping 2) available on request basis. In addition there is a queen size sofa bed in the office which can sleep 2 children or teenagers. Each of the 3 stunning air-conditioned bedrooms has a fantastic ocean view. Set in a secure gated community, just 5 minutes walk to Sosua beach and town, and within 10 minutes drive to Kite Beach and Cabarete Beach. Just a short 15 minutes from Puerto Plata POP, international airport. Charming two bedrooms, two bathrooms, fully furnished, nicely decorated, TV cable and Internet wireless. All queen size bed. Enjoy the private swimming pool area with its two enormous mango trees. 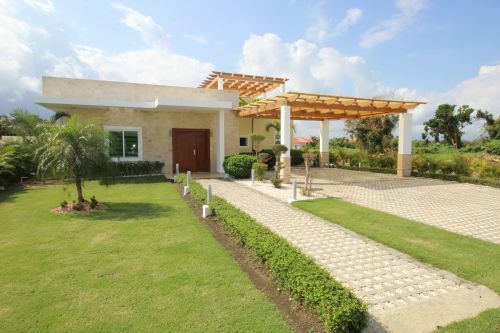 Close to the entrance of the Residencial and walking distance to Sosua beach and activities. One King size bed and one Queen size bed. Light maid service twice weekly. The Villa is situated in a private gated community with 24 hour services, including 24 back up electric and 24 hour security. Just 5 minutes walk to town and the beach! Full supermarket and restaurants 5 minutes walk. This exquisitely furnished beach front four bedroom condo is fully equipped and graciously decorated to create a memorable Caribbean vacation experience. The Apartment is an ideal destination for a honeymoon getaway, golf vacations, thrilling adventures and water sports such as surfing, windsurfing and kite boarding, for which Cabarete is renowned worldwide. A refundable damage deposit of $500 must be paid in cash upon arrival. This deposit is fully refundable upon departure provided that all personal and property are in the same condition as when occupancy commenced. Paradise was never lost. It’s here waiting for you… Beautifully landscaped exteriors, elegantly furnished and spacious interiors, the apartment has all the amenities required to ensure you enjoy this fabulous hideaway in the Caribbean.Apartments offers 3-bedrooms , 3 bathr., Jacuzzi in master math, spacious living room, luxury kitchen fully equipped, fully air-conditioned, laundry with washer and dryer, large furnished balcony. Bedrooms have king, queen and 2 single beds, Living room has a TV and a DVD player. High-speed wireless Internet. 24-hr security. Monthly rate (3 months+) starting at US$ 1850 / month plus electricity for the 2 bedroom condo. Monthly rate (3 months+) starting at US$ 2500 / month plus electricity for the 3 bedroom condo. Reservation & Payment: Upon reservation, a non-refundable deposit of 50% is due by wire transfer or Western Union. The remaining balance has to be paid 7 days prior to arrival, or in cash on arrival. Looking for the perfect getaway with the guys, the girls, friends, multiple families, family reunions, wedding parties? Enjoy our large ocean view mansion with lots of amenities for large groups. This sprawling Mediterranean ocean view mansion has all the the latest updated and top of line finishes. Located between Sosua and Cabarete, this luxurious estate is situated on over 5 acres with breathtaking views of the ocean. The spectacular landscaped yard includes terraces & patios with multiple fire pits, outdoor kitchen, spa area & water feature. The interior and exterior is all above grade and features 10 Bedrooms, 10 Bathrooms, more than 25,000 Square Feet living area. This home has everything you could need including a private chef and incredible views and luxury amenities all around. The rental includes a chef, waiter, daily maid service, and maintenance.